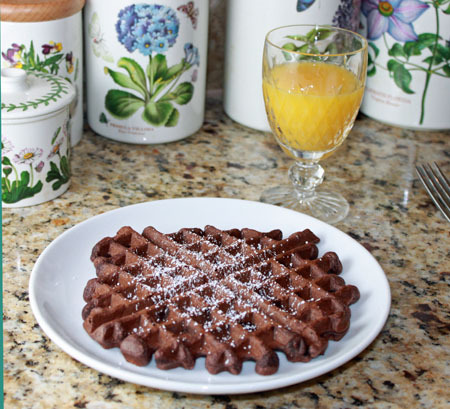 Who wants an extra hour of sleep when there are chocolate waffles on the table? Thanks to Alton Brown for today’s breakfast. His chocolate waffle recipe was a bit hit. As you can see by the photo, the edges were a bit well done due to my attempt to make them crisp. I don’t think these waffles were meant to be super crispy right out of the waffle maker, but it wasn’t really a big deal. They weren’t what I’d call soggy and they had a delicious, not-too-sweet chocolate flavor. As for the toppings, if you like chocolate and maple then a little syrup might be okay, but my tasters wanted strawberries and whipped cream. Since we don’t have a lot of people to feed and I’m too busy trying new waffle recipes to freeze these, I scaled down Alton’s recipe to make 3 good size waffles. I also used vegetable oil in place of melted butter. The full recipe is on Food TV (link above) and this is the scaled down version. Mix the flour, sugar, cocoa powder, baking powder, salt, and baking soda together in a bowl. In another bowl or in a large measuring cup, beat the egg. Stir in the oil, vanilla, and buttermilk. Add the wet ingredients to the dry and stir in the chocolate chips just until combined. Allow to rest for 5 minutes. Pour ½ cup of waffle batter (or amount recommended by manufacturer of your waffle iron – mine’s a Cuisinart) onto the center of the iron. Close the iron top and cook until the waffle is crispy on both sides and is easily removed from iron. Serve immediately or keep warm in a 200 degree F oven until ready to serve. Camille and Ester, I was the same way. Waffles seemed sort of interesting, but I wasn’t motivated enough to buy a waffle iron. I ended up ordering an inexpensive one off the Internet (New Egg has the Cuisnarts for under $30) and it was totally worth it. Dawn, your pumpkin pop tart clones looked good too! BB, of all the flavors I’ve made I think the chocolate waffles were the most popular. Mary, thanks for the tip on the melted butter. Normally I would have used it as per Alton’s directions, but I figured oil would be more convenient and I was low on butter anyway. I will say that the Cuisinart manual waffles were pretty crisp and they used oil, which is what made me think the oil might help in that department. Maybe I did the opposite of what I needed to do to achieve the goal. I read the reviews and wasn’t the only one whose waffles weren’t super crispy, though. Cheryl, thanks!! I used the toaster earlier this week to crisp some of the Cuisinart manual waffles. It worked perfectly. Randi, I’ll get on that right away. FRK, I would love to know your recipe for thin, crisp, Danish style waffles. I will email you. Also, the waffles I’ve been making are all medium-thick. I think I need a special waffle maker to make Belgian style. Denise, these would be great for dessert. That reminds me of Florence, Italy, where people walk around eating waffles from corner shops. They are very popular in Florence. Now I wish I’d bought myself one when we were there just so I could compare my old American style waffles to Florentine dessert waffles. Jo, ditto one what I said about the little Cuisinart waffle maker. It’s a good first time waffle maker. These would make my waffle-loving kids very happy. And don’t you think they would be good with a scoop of ice cream and hot fudge and caramel sauce? Not for breakfast, of course! How about this for dessert? Cut the waffles into quarters and arrange two pieces in a shallow serving dish. Top with a scoop of ice cream – all kinds of flavor choices. Then drizzle with either fudge or caramel syrup. Garnish with either a strawberry or a couple raspberries. The hot and cold, crunchy and creamy textures. It could be amazing. I am finding it difficult to see from your pictures, if your waffles are the thick, belgian type? hey anna, you once gave me a recipe from Southern Living for Pecan bars. Can you send it again. My ex refuses to give me my recipes from my hard drive back in Canada. Thanks. 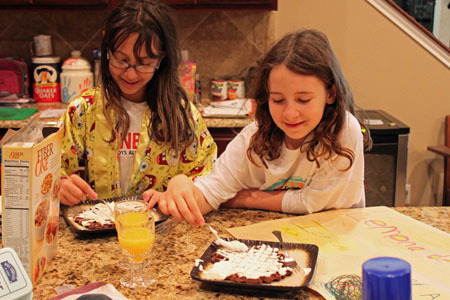 Spreading our waffles with butter and lots of Powdered Sugar has been mine and my sons favorite for years. If the waffles get cold before they are scooped up just put them back in a warm waffle iron for about a minute to get a hot crisp product. We use the toaster during the week but the waffle iron is better to reheat. Has anybody tried the waffle pan that I have seen at some of the cooking stores? I don’t make waffles often, but if I recall correctly using melted butter (instead of oil) will result in crisp waffles. The recipe I’ve always been happy with is a Pillsbury recipe I’ve used for years that included variations for apple waffles, blueberry, banana, whole wheat, etc.. Maybe I’ll make some within the next week or two! Yum yum! Strawberries and whip cream couldn’t be a better component! ha ha chocolate waffles. my all time favorite. Thanks for sharing. Waffles are something that I have always wanted to make, I just don’t have the waffle iron. 🙁 Do you think there is any substitute way to cook it? Thank you. It’s moments like this that make me wonder why I don’t have a waffle iron. Curses!